Start by navigation to the reports are of Launchcloud. This is the same process for downloading data also. This will take you to a tile of all folders where again you select the one necessary that you want to view. You will see the tiles for each folder have a wavy line if you have made submissions. This line will change color depending if it is just text data or media that have been submitted. Selecting a tile will open up the folder and again you will have a view of all forms within that folder with a line of data activity. 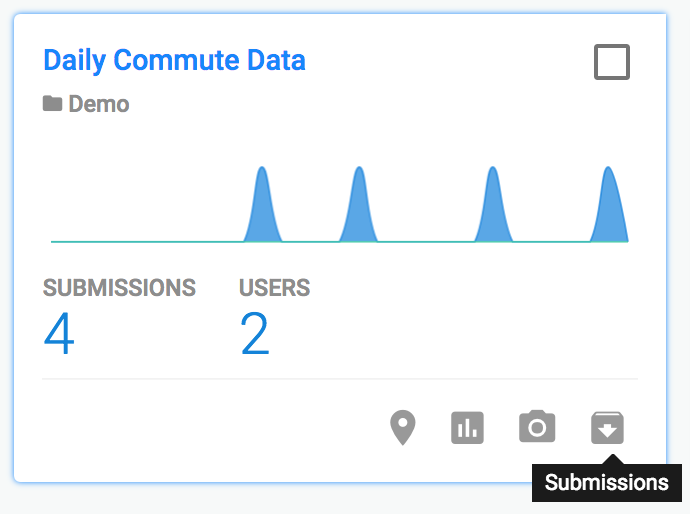 This is where you will have the option to view all different types of data collected but the most common is submission view. To delete submissions it is best to locate to submission view where you can see the form as a whole. Submission view displays all submissions and all data on the submissions. Here you can show fields for quick referencing, open the submission to edit or even add admin notes to the submission. First, use the filter to ensure you have all submissions showing if you have made more than 250.
if you want to find a specific submission you can use the advanced filters to find it straight away. Once you have found the submission(s) you want to delete, you can either select specific submissions using the checkboxes on the left or you can use the checkbox at the top of the page to select all submissions. You see below, selecting the top checkbox makes the selection of all submissions which is detailed at the bottom of the page. Alongside the number of submissions selected you will see the option to delete or download. This also appears when you make individual selections. When data is deleted from Launchcloud it is stored in a ‘soft delete’ mode for up to 30 days. This is in case you delete your whole campaign or data you really needed, you can look to restore it back into your account. However, If you wish to see your deleted data and remove it completely from Launchcloud and the Launchcloud servers, You can do so manually yourself by confirming the delete which will remove the data completely from the Launchcloud servers. Please be aware that once this has been completed there is no way that this data can be returned to your account. 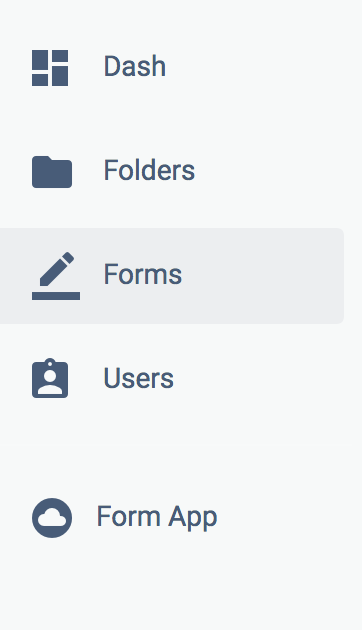 You can see all data that has been deleted for Folders, Forms & Reports. To view all data you have deleted recently, locate to the location of where it would be, so if it was a form, locate to forms. You then need to use the filters at the top of the page to filter and show all deleted data in the last 30 days. You will see deleted files just like you do the forms that are active in your account although the information bar itself is displayed differently. You will see a preview of the deleted file along with all data regarding where it was stored and how many submissions were completed on that form. You will see over on the far right of the Information Bar there is also data on when it was deleted date and time. Now you can see all the data you have in soft delete mode, you may want to completely remove the data from Launchcloud's’ servers sooner than the 30 days it takes to be hard deleted from our servers, doing this will remove the form, folder or reports from Launchcloud servers completely. Once you have your soft-deleted data displayed you can select which items you wish to remove completely. Remeber, once this is removed there is no way possible for the data to be recovered. This action will be performed 30 days after soft deleting an item thus making sure your Launchcloud account is not harboring any data you do not need and keeping the speed of your account to a max. Select the Folder, Form or Report that you want to completely remove by using the checkboxes on the Left Hand Side. You can see the bar for the element itself displays a checkbox on the left and the original data the data was deleted on the right. Once you have selected all that you want to delete, you will have the delete bar appear at the bottom of the page. On this bar, you will see a few options. Firstly, you will see how many items are selected, you also have the choice to delete or restore these elements. Selecting ‘confirm delete’ will completely remove the data you have selected. You will need to confirm that you want to remove this data first. Once you have confirmed delete you will see the page refresh and the item(s) selected will no longer be there. This data is now completely removed from Launchcloud and its servers and can no longer be recovered. To restore soft-deleted data you need to take many of the steps as if you were going to completely remove the data from Launchcloud. We first start by showing the soft-deleted data that you have on your account. You need to do this in the area of Launchcloud relevant to the item you are looking for. EG, if it is a folder you want to restore you need to look in folders, the same if it was a form or a complete report, all will be found in their own are of Launchcloud. Once you have located the element you want to restore, Select it using the checkbox on the left side and again you will have options appear at the bottom of the page. As you are looking to restore the element to its existing location you will select ‘Restore’. Once selected you will be presented with a message to confirm you are restoring the correct elements. Once confirmed you will see the element(s) selected back in their right locations. Please remember this can only be completed less than 30 days after you originally deleted the item, once 30 days have passed from when the element was first deleted, it will be deleted by Launchcloud automatically and no longer be recoverable.